Using the evidence-based strategy of sentence combining, students combine multiple ideas into a single sentence. They then receive instant feedback designed to help them improve the clarity and precision of their sentences. 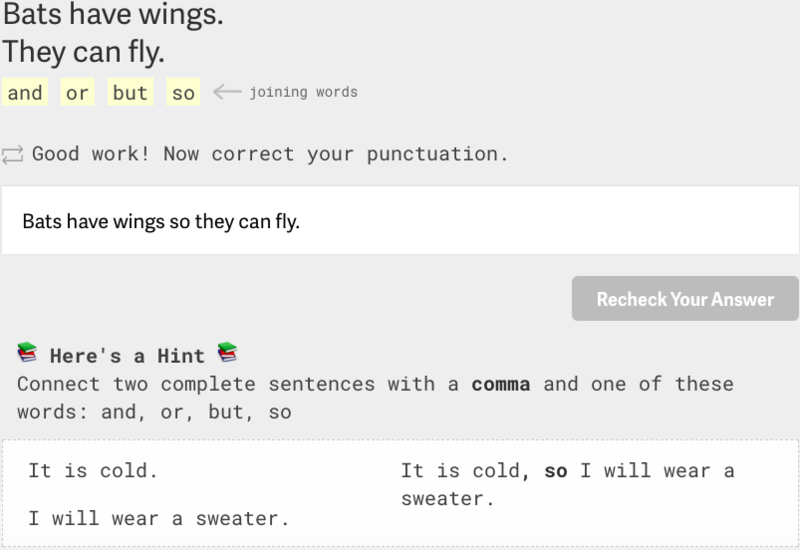 The student receives feedback about how the joining word needs to communicate a reason for the flying. 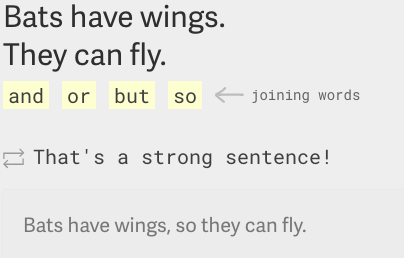 This feedback guides the student on how to make their sentence even more specific by suggesting that the joining word should show that having wings is the reason bats fly. The feedback from the third attempt gives the student further advice on how to tighten the sentence by using correct punctuation. In this case, while the student used the correct joining word, it needs a comma. It also gives you an example of when and how to use commas by matching the sentence structure to the structure the student used. Fourth Attempt: Student adds a comma.